The Polk County School Board has made it possible for all public school high school students in the County to use public transportation for FREE. All students need a permission slip signed by parents and a school ID badge with three tomahawk shaped holes punched into that ID to ride any standard transit bus in Polk County whenever and wherever the buses are running. Hole punches are available with each school’s transportation coordinator. You can download a permission slip or receive one from your school. Once the permission slip is filled out, it must be returned to the school to get the proper ID hole punches. This program, the first of its kind in the nation, allows students to take advantage of after school activities that they would not have done because of a lack of transportation. Students also have access to public transit to get to entertainment, shopping and recreation during the weekdays. Each bus route has a unique schedule. You must know when the bus will be passing your location so as not to miss your ride. Time schedule information is available on the ridecitrus.com website under the Routes and Services. Each route has a printable map with time points. Routing information is available on FindMyRoutes.com. Put in your starting address and the service will tell you the closest bus stop to your location. 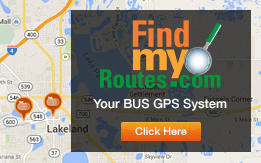 QR codes for FindMyRoutes.com are on over 1,500 bus stops throughout Polk County. Check out Google Transit. It will give you complete route information. It’s one stop shopping. Be Smart! Know where your bus will be and when it will be there before you head out the door. Map out your return trip. Consider when the last bus comes and, if you need to transfer, allow time to connect. COLTS program participants are allowed unlimited access Monday through Friday during normal hours of operation. Bus etiquette includes common courtesy to other riders, Rules of the Road are listed on www.ridecitrus.com under the How to Ride/Fares tab.